I’m not much of a cook. I’m great with toast, and microwave food. I didn’t need anything else when I lived in Chicago. I even got by with it when it was my turn to cook at the fire station. Stew, soup, chili – all of those are great fresh from the freezer to the microwave. Now that I live in Sweet Pepper, Tennessee – food is a big deal. They have this huge pepper festival every year that I’m expected to participate in as fire chief. It’s kind of like a community service. New, better, more exciting hot pepper recipes are the keywords. I don’t know what I’d do if it wasn’t for the ghost who lives with me. Eric Gamlyn can be a little moody, but he’s great cook! He’s original and inventive – if a little messy and not much for cleaning up after himself. I don’t mind too much. He makes me look good at the festival! We won a blue ribbon this year! Here is one of Eric’s recipes for hot chocolate with cayenne pepper. It's great on a cold winter night! Mix water, cocoa powder and sugar (or substitute) in a saucepan. Slowly bring to a simmer over medium heat, stirring constantly. Cook until mixture thickens. Mix in remaining ingredients and heat, but don’t boil. Serve hot with cinnamon sticks to garnish! 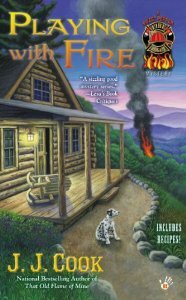 WIN A PRINT COPY OF PLAYING WITH FIRE BY LEAVING A COMMENT! Fire Chief Stella Griffin is working to solve the mysterious death of her predecessor, Eric Gamlyn—who also haunts her cabin. Yet the more she learns, the more burning questions she must answer. Just as Stella thinks she has a lead from Deputy Chum, someone snuffs her hopes—and the lawman. That recipe sounds delicious. Can't wait to try it. Looking forward to reading Playing With Fire. Not sure if I'd care for Chocolate with cayenne pepper in it, but the series sounds good. A female main character in a traditionally male job and a bit of the supernatural thrown in for good measure. I didn't think so either, Dianne, but it's really good! Thanks for stopping by! Looks like a great book! Hot chocolate with a little spice is fantastic! Everything is better with a little zing! Thanks, Kim! "I’m not much of a cook. I’m great with toast, and microwave food." I'm a single senior and that's me in a nutshell! I'm really looking forward to this series and have it on my wishlist. Firefighters everywhere - thank you! I'm sure I would love hot pepper in hot chocolate as I love cayenne. This book sounds excellent! Thanks for stopping by, Nancy! That is hot chocolate for a crowd! Great for a cold day warm up. There's always a crowd at the firehouse! Have to try that hot chocolate recipe. Love dark chocolate with chili pepper. Yum! Of course, I am eager to read the book. Dark chocolate and chili pepper. yum! Sounds like a great read! Can't wait to read it, definitely on my "To Read" list! I've just recently become hooked on books with a touch of the paranormal, so this sounds great. The cocoa sounds interesting, I may just have to try this. Love the paranormal, Debbie! Goes great with mystery! Both the hot chocolate and the book sound interesting! Love chocolate and spice together!! Can't wait to read this one!! The combination of chocolate and pepper sounds counterintuitive but I'll bet that it's delish! Thanks for the recipe and featuring a book that's now on my five-alarm TBR list! I'm a hot chocoholic, but have never tried it with cayenne! Can't forget the marshmallows on top! thank you for the chance to win this book!! Thanks for stopping by, Cyn! Oooh, I will have to try this! The book or the recipe? The recipe sounds interesting but the book sounds very good! Thanks for stopping by, Elaine! This sounds like a great read! I love the Great Smokey Mountains and would love to read this series. I'm not much for hot peppers but I have been waiting for this book to come out. I really need to get reading! We hope you enjoy it, Susie! Birdhouse Books is our winner. Thanks to everyone for participating!